Personalize this Seasonal Canvas with your family's name (i.e., The Smiths) or "Family" instead of "Welcome" (please order at time of registration). Finish as a beautiful display tray inspired by MacKenzie Childs' black & white checkered designs. 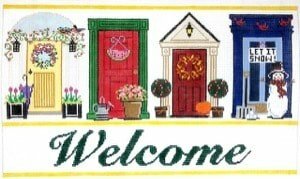 Exchange your Seasonal Doors canvas throughout the year with other door canvas designs: Christmas, Hannukah, Halloween, and July 4th. Note - Your deposit is the class fee that secures your spot in the class. We will contact you for credit card information for the canvas; the stitch guide, thread kit and stretcher bars can all be purchased at the first class session.